Furnace Oil (F.O) and Light Diesel Oil (LDO) are the fuels largely used as a fuel to generate electricity and heat in a number of sectors in India. 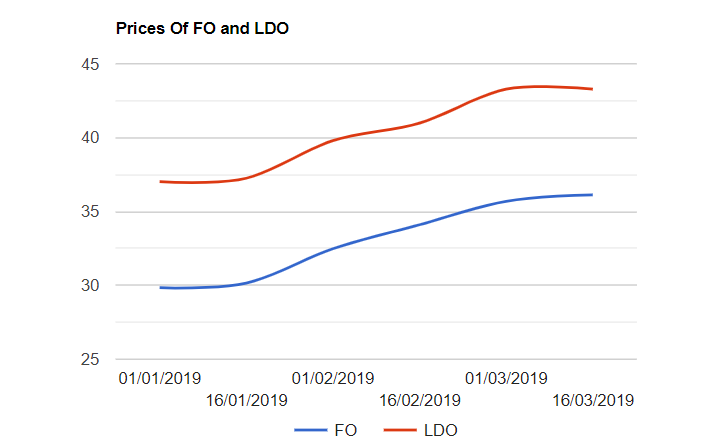 Both FO and LDO prices fluctuates on fortnightly basis as they are aligned with international prices. As predicted, In India, Industrial fuel oil prices are increased by above 1 pct wef 16/03/19, for the second half of March across all the oil marketing company depos. Furnace oil (F.O) prices are inched up by Rs.440 per KL and Light Diesel Oil (LDO) prices are remained unchanged as on 16/03/2019 in line with a moderate changes in global oil markets during the recent weeks. Furnace oil (F.O) prices are increased by around 20 pct and Light Diesel Oil (LDO) prices are pushed up by 16 pct since January 16th. As per the publications of oil marketing companies, At Visakha depo, Furnace oil prices rose by Rs.440/KL to Rs.36130/KL and LDO prices are remained unchanged at Rs.43280/KL. In the Singapore market, IFO 180 cSt and 380 cSt graded fuel oil prices were sagged up by $9 or 2 pct where as the rupee was appreciated around 1.38 paise against $ during the last fortnight.